Regulation (EC) No 595/2009 is one of the separate regulatory acts under the type-approval procedure laid down by Directive 2007/46/EC. Regulation (EC) No 595/2009 requires new heavy duty vehicles and engines to comply with new emission limits and introduces additional requirements on access to information. The technical requirements will apply from 31 December 2012 for new types of vehicles and from 31 December 2013 for all new vehicles. The specific technical provisions necessary to implement Regulation (EC) No 595/2009 should be adopted. Therefore, the present Regulation aims at setting the requirements necessary for the type-approval of Euro VI specification vehicles and engines. Article 5(4) of Regulation (EC) No 595/2009 requires the Commission to adopt implementing legislation setting out specific technical requirements relating to the control of emissions from vehicles. Therefore, it is appropriate to adopt those requirements. Following the adoption of the main requirements for type-approval of heavy duty motor vehicles and engines by Regulation (EC) No 595/2009, it is necessary to establish administrative provisions for that EC type-approval. Those administrative requirements should include provisions for conformity of production and in-service conformity to ensure continued good performance of production vehicles and engines. In accordance with Article 6 of Regulation (EC) No 595/2009, it is also necessary to establish requirements to ensure that vehicle on-board diagnostic (hereinafter ‘OBD’) and vehicle repair and maintenance information is readily accessible, so as to ensure that independent operators have access to such information. In accordance with Regulation (EC) No 595/2009, the measures provided for in this Regulation regarding access to vehicle repair and maintenance information, information for diagnostic tools and the compatibility of replacement parts with vehicle OBD systems, should not be restricted to emission-related components and systems but cover all aspects of a vehicle subject to type-approval within the scope of this Regulation. In accordance with Article 5 of Regulation (EC) No 595/2009, the Commission should adopt measures for implementing the use of portable measurement systems for verifying the actual in-use emissions and verifying and limiting the off-cycle emissions. It is therefore necessary to set out, within an appropriate timeframe, provisions on off-cycle emissions both at type-approval and for verifying and limiting the off-cycle emissions in actual use of the vehicles. For the purpose of in-service conformity a procedure using portable emissions measurement systems (hereinafter ‘PEMS’) should be introduced. The PEMS procedures introduced through this Regulation should be subject to an assessment on the basis of which the Commission should be empowered to amend the in-use provisions. In accordance with Article 5(4)(d) of Regulation (EC) No 595/2009, it is necessary to establish requirements for type-approval of replacement pollution control devices so as to ensure that they function correctly. In accordance with Article 5(4)(d) of Regulation (EC) No 595/2009, it is necessary to establish requirements for determining deterioration factors to be used for verifying the durability of engine systems. In addition and subject to the results of research and development on methods for bench ageing of engine systems the Commission should be empowered to amend the provisions for determining deterioration factors. As provided for by Article 12(1) of Regulation (EC) No 595/2009, new limit values and a measurement procedure for the number of particles emitted should be introduced. The measurement procedure should be based on the work of the Particulate Measurement Programme (PMP) of the United Nations Economic Commission for Europe (hereinafter ‘UN/ECE’). In accordance with Article 12(2) of Regulation (EC) No 595/2009, limit values for the World Harmonized Transient Driving Cycle (hereinafter ‘WHTC’) and the Worldwide Harmonised Steady state Cycle (hereinafter ‘WHSC’) as specified in Annex 4B to Regulation No 49 of the Economic Commission for Europe of the United Nations (UN/ECE) — Uniform provisions concerning the measures to be taken against the emission of gaseous and particulate pollutants from compression-ignition engines for use in vehicles, and the emission of gaseous pollutants from positive-ignition engines fuelled with natural gas or liquefied petroleum gas for use in vehicles (3) should be introduced. The Commission should assess the need for specific measures regarding multi-setting engines, and should be empowered to amend the provisions in accordance with the results of that assessment. Regulation (EC) No 595/2009 and Directive 2007/46/EC should therefore be amended accordingly. This Regulation lays down measures for the implementation of Articles 4, 5, 6 and 12 of Regulation (EC) No 595/2009. It also amends Regulation (EC) No 595/2009 and Directive 2007/46/EC. ‘continuous regeneration’ means the regeneration process of an exhaust after-treatment system that occurs either permanently or at least once per World Harmonized Transient Driving Cycle (hereinafter ‘WHTC’) hot start test. 1. In order to receive an EC type-approval of an engine system or engine family as a separate technical unit, EC type-approval of a vehicle with an approved engine system with regard to emissions and vehicle repair and maintenance information, or an EC type-approval of a vehicle with regard to emissions and vehicle repair and maintenance information the manufacturer shall, in accordance with the provisions of Annex I, demonstrate that the vehicles or engine systems are subject to the tests and comply with the requirements set out in Annexes III to VIII, X, XIII, and XIV. The manufacturer shall also ensure compliance with the specifications of reference fuels set out in Annex IX. 2. In order to receive EC type-approval of a vehicle with an approved engine system with regard to emissions and vehicle repair and maintenance information, or an EC type-approval of a vehicle with regard to emissions and vehicle repair and maintenance information the manufacturer shall ensure compliance with the installation requirements set out in Section 4 of Annex I. 3. In order to receive an extension of the EC type-approval of a vehicle with regard to emissions and vehicle repair and maintenance information type-approved under this Regulation with a reference mass exceeding 2 380 kg but not exceeding 2 610 kg the manufacturer shall meet the requirements set out in Appendix 1 to Annex VIII. 4. The provisions for alternative approval specified in point 2.4.1 to Annex X and point 2.1 to Annex XIII shall not apply for the purpose of an EC type-approval of an engine system or engine family as a separate technical unit. 5. Any engine system and any element of design liable to affect the emission of gaseous and particulate pollutants shall be designed, constructed, assembled and installed so as to enable the engine, in normal use, to comply with the provisions of Regulation (EC) No 595/2009 and those of this Regulation. The manufacturer shall also ensure compliance with off-cycle requirements set out in Article 14 and Annex VI to this Regulation. 6. In order to receive an EC type-approval of an engine system or engine family as a separate technical unit or an EC type-approval of a vehicle with regard to emissions and vehicle repair and maintenance information the manufacturer shall ensure compliance with the requirements on fuel range for a universal fuel approval or in case of a positive-ignition engine fuelled with natural gas and LPG a restricted fuel range approval as specified in Section 1 of Annex I. 7. In order to receive an EC type-approval in the case of a petrol or E85 fuelled engine, the manufacturer shall ensure that the specific requirements for inlets to fuel tanks for petrol and E85 fuelled vehicles laid down in Section 4.3 of Annex I are fulfilled. 8. In order to receive an EC type-approval the manufacturer shall ensure that the specific requirements for electronic system security laid down in point 2.1 of Annex X are fulfilled. 9. The manufacturer shall take technical measures so as to ensure that the tailpipe emissions are effectively limited, in accordance with this Regulation, throughout the normal life of the vehicle and under normal conditions of use. Those measures shall include ensuring that the security of hoses, joints and connections, used within the emission control systems, are constructed so as to conform to the original design intent. 10. The manufacturer shall ensure that the emissions test results comply with the applicable limit value under the test conditions specified in this Regulation. 11. The manufacturer shall determine deterioration factors that will be used to demonstrate that the gaseous and particulate emissions of an engine family or engine-aftertreatment system family remain in conformity with the emission limits set out in Annex I to Regulation (EC) No 595/2009 over the normal useful life periods set out in Article 4(2) of that Regulation. The procedures for demonstrating the compliance of an engine system or engine-aftertreatment system family over the normal useful life periods are set out in Annex VII to this Regulation. 12. For positive-ignition engines subject to the test set out in Annex IV, the maximum permissible carbon monoxide content in the exhaust gases at normal engine idling speed shall be that stated by the vehicle manufacturer. However, the maximum carbon monoxide content shall not exceed 0,3 % vol. At high idle speed, the carbon monoxide content by volume of the exhaust gases shall not exceed 0,2 % vol., with the engine speed being at least 2 000 min-1 and Lambda being 1 ± 0,03 or in accordance with the specifications of the manufacturer. 13. In the case of a closed crankcase, manufacturers shall ensure that for the test set out in Annex V, the engine’s ventilation system does not permit the emission of any crankcase gases into the atmosphere. If the crankcase is of an open type the emissions shall be measured and added to the tailpipe emissions following the provisions set out in Annex V.
14. When applying for type-approval, manufacturers shall present to the approval authority information showing that the deNOx system retains its emission control function during all conditions regularly pertaining in the territory of the Union, especially at low temperatures. In addition, manufacturers shall provide the approval authority with information on the operating strategy of any EGR system, including its functioning at low ambient temperatures. This information shall also include a description of any effects on emissions of operating the system under low ambient temperatures. 15. Vehicles and engines shall only be type-approved according to Regulation (EC) No 595/2009 and this Regulation once measurement procedures for measuring PM number as set out in Annex I to Regulation (EC) No 595/2009, any specific provisions regarding multi-setting engines that are needed and provisions implementing Article 6 of that Regulation have been adopted. 1. Manufacturers shall ensure that all engine systems and vehicles are equipped with an OBD system. 2. The OBD system shall be designed, constructed and installed on a vehicle in accordance with Annex X, so as to enable it to identify, record, and communicate the types of deterioration or malfunction specified in that Annex over the entire life of the vehicle. 3. The manufacturer shall ensure that the OBD system complies with the requirements set out in Annex X, including the OBD in-use performance requirements, under all normal and reasonably foreseeable driving conditions encountered in the Union, including the conditions of normal use specified in Annex X. 4. When tested with a qualified deteriorated component, the OBD system malfunction indicator shall be activated in accordance with Annex X. The OBD system malfunction indicator may also be activated at levels of emissions below the OBD thresholds limits specified in Annex X. 5. The manufacturer shall ensure that the provisions for in-use performance of an OBD engine family laid down in Annex X are followed. 6. The OBD in-use performance related data shall be stored and made available without any encryption through the standard OBD communication protocol by the OBD system in accordance with the provisions of Annex X. 7. If the manufacturer chooses, during a period of 3 years after the dates specified in Article 8(1) and (2) of Regulation (EC) No 595/2009 OBD systems may comply with alternative provisions as specified in Annex X to this Regulation and referring to this paragraph. 8. If the manufacturer chooses, until 1 September 2014 in the case of new types of vehicles or engines and until 1 September 2015 for all new vehicles sold, registered or put into service within the Union, he may use alternative provisions for the monitoring of the DPF as set out in point 2.3.3.3 of Annex X. 1. The manufacturer shall submit to the approval authority an application for EC type-approval of an engine system or engine family as a separate technical unit. 2. The application referred to in paragraph 1 shall be drawn up in accordance with the model of the information document set out in Appendix 4 to Annex I. For that purpose Part 1 of that Appendix shall apply. an extended documentation package that shall remain confidential. The extended documentation package may be kept by the approval authority, or be retained by the manufacturer, at the discretion of the approval authority, but shall be made available for inspection by the approval authority at the time of approval or at any time during the validity of the approval. When the documentation package is retained by the manufacturer, the approval authority shall take the necessary measures to ensure that the documentation is not being altered after approval. where appropriate, copies of other type-approvals with the relevant data to enable extension of approvals and establishment of deterioration factors. 5. The manufacturer shall submit to the technical service responsible for the type-approval tests an engine or, as appropriate, a parent engine representative of the type to be approved. 6. Changes to the make of a system, component or separate technical unit that occur after a type-approval shall not automatically invalidate a type-approval, unless its original characteristics or technical parameters are changed in such a way that the functionality of the engine or pollution control system is affected. 1. If all the relevant requirements are met, the approval authority shall grant an EC type-approval of an engine system or engine family as a separate technical unit and issue a type-approval number in accordance with the numbering system set out in Annex VII to Directive 2007/46/EC. Without prejudice to the provisions of Annex VII to Directive 2007/46/EC, Section 3 of the type-approval number shall be drawn up in accordance with Appendix 9 to Annex I to this Regulation. An approval authority shall not assign the same number to another engine type. 2. When granting an EC type-approval under paragraph 1, the approval authority shall issue an EC type-approval certificate using the model set out in Appendix 5 to Annex I. 1. The manufacturer shall submit to the approval authority an application for EC type-approval of a vehicle with an approved engine system with regard to emissions and access to vehicle repair and maintenance information. 2. The application referred to in paragraph 1 shall be drawn up in accordance with the model of the information document set out in Part 2 of Appendix 4 to Annex I. This application shall be accompanied by a copy of the EC type-approval certificate for the engine system or engine family as a separate technical unit issued in accordance with Article 6. 3. The manufacturer shall provide a documentation package that fully explains the elements of the warning and inducement system that is on board the vehicle and required by Annex XIII. This documentation package shall be provided in accordance with Article 5(3). where appropriate, copies of other type-approvals with the relevant data to enable extension of approvals. 5. Changes to the make of a system, component or separate technical unit that occur after a type-approval shall not automatically invalidate a type-approval, unless its original characteristics or technical parameters are changed in such a way that the functionality of the engine or pollution control system is affected. 1. If all the relevant requirements are met, the approval authority shall grant an EC type-approval of a vehicle with an approved engine system with regard to emissions and access to vehicle repair and maintenance information and issue a type-approval number in accordance with the numbering system set out in Annex VII to Directive 2007/46/EC. 2. When granting an EC type-approval under paragraph 1, the approval authority shall issue an EC type-approval certificate using the model set out in Appendix 6 to Annex I. 2. The application referred to in paragraph 1 shall be drawn up in accordance with the model of the information document set out in Appendix 4 to Annex I. For that purpose Parts 1 and 2 of that Appendix shall apply. 3. The manufacturer shall provide a documentation package that fully explains any element of design which affects emissions, the emission control strategy of the engine system, the means by which the engine system controls the output variables which have a bearing upon emissions, whether that control is direct or indirect, and fully explains the warning and inducement system required by Annex XIII. This documentation package shall be provided in accordance with Article 5(3). 4. In addition to the information referred to in paragraph 3, the manufacturer shall submit the information required by Article 5(4)(a) to (i) and Article 7(4)(a) to (e). 5. The manufacturer shall submit to the technical service responsible for the type-approval tests an engine representative of the type to be approved. 1. If all the relevant requirements are met, the approval authority shall grant an EC type-approval of a vehicle with regard to emissions and access to vehicle repair and maintenance information and issue a type-approval number in accordance with the numbering system set out in Annex VII to Directive 2007/46/EC. 2. When granting an EC type-approval under paragraph 1, the approval authority shall issue an EC type-approval certificate using the model set out in Appendix 7 to Annex I. 2. Conformity of production shall be checked on the basis of the description in the type-approval certificates set out in Appendices 5, 6 and 7 to Annex I, as applicable. 3. Conformity of production shall be assessed in accordance with the specific conditions laid down in Section 7 of Annex I and the relevant statistical methods laid down in Appendices 1, 2 and 3 to that Annex. 1. Measures to ensure in-service conformity of vehicles or engine systems type-approved under this Regulation or Directive 2005/55/EC of the European Parliament and of the Council (4) shall be taken in accordance with Article 12 of Directive 2007/46/EC, and complying with the requirements of Annex II to this Regulation in the case of vehicles or engine systems type-approved under this Regulation and with the requirements of Annex XII to this Regulation in the case of vehicles or engine systems type-approved under Directive 2005/55/EC. 2. The technical measures taken by the manufacturer shall be such as to ensure that the tailpipe emissions are effectively limited, throughout the normal life of the vehicles under normal conditions of use. The conformity with the provisions of this Regulation shall be checked over the normal useful life of an engine system installed in a vehicle under normal conditions of use as specified in Annex II to this Regulation. 3. The manufacturer shall report the results of the in-service testing to the approval authority which granted the original type-approval in accordance with the initial plan submitted at type-approval. Any deviation from the initial plan shall be justified to the satisfaction of the approval authority. 4. If the approval authority which granted the original type-approval is not satisfied with the manufacturer’s reporting in accordance with Section 10 of Annex II, or has reported evidence of unsatisfactory in-service conformity, the authority may order the manufacturer to run a test for confirmatory purposes. The approval authority shall examine the confirmatory test report supplied by the manufacturer. 5. Where the approval authority which granted the original type-approval is not satisfied with the results of in-service tests or confirmatory tests in accordance with the criteria set out in Annex II, or based on in-service testing conducted by a Member State, it shall require the manufacturer to submit a plan of remedial measures to remedy the non-conformity in accordance with Article 13 and Section 9 of Annex II. 6. Any Member State may conduct and report its own surveillance testing, based on the in-service conformity testing procedure set out in Annex II. Information on the procurement, maintenance, and manufacturer’s participation in the activities shall be recorded. On request by an approval authority the approval authority that granted the original type-approval shall provide the necessary information about the type-approval to enable testing in accordance with the procedure set out in Annex II. 7. If a Member State demonstrates that an engine or vehicle type does not conform to the applicable requirements of this Article and Annex II, it shall notify through its own approval authority without delay the approval authority which granted the original type-approval in accordance with the requirements of Article 30(3) of Directive 2007/46/EC. Following that notification and subject to the provision of Article 30(6) of Directive 2007/46/EC, the approval authority of the Member State which granted the original type-approval shall promptly inform the manufacturer that an engine or vehicle type fails to satisfy the requirements of these provisions. 8. Following the notification referred to in paragraph 7 and in cases where earlier in-service conformity testing showed conformity, the approval authority which granted the original type-approval may require the manufacturer to perform additional confirmatory tests after consultation with the experts of the Member State that reported the failing vehicle. If no such test data is available, the manufacturer shall, within 60 working days after receipt of the notification referred to in paragraph 7, either submit to the approval authority which granted the original type-approval a plan of remedial measures in accordance with Article 13 or perform additional in-service conformity testing with an equivalent vehicle to verify whether the engine or vehicle type fails the requirements. In the case where the manufacturer can demonstrate to the satisfaction of the approval authority that further time is required to perform additional testing, an extension may be granted. 9. Experts of the Member State that reported the failing engine or vehicle type in accordance with paragraph 7 shall be invited to witness the additional in-service conformity tests referred to in paragraph 8. Additionally, the results of the tests shall be reported to that Member State and the approval authorities. If these in-service conformity tests or confirmatory tests confirm the non-conformance of the engine or vehicle type, the approval authority shall require the manufacturer to submit a plan of remedial measures to remedy the non-conformity. The plan of remedial measures shall comply with the provisions of Article 13 and Section 9 of Annex II. If those in-service conformity tests or confirmatory tests show conformity the manufacturer shall submit a report to the approval authority which granted the original type-approval. The report shall be submitted by the approval authority which granted the original type-approval to the Member State that reported the failing vehicle type and the approval authorities. It shall contain the test results according to Section 10 of Annex II. 10. The approval authority which granted the original type-approval shall keep the Member State which had established that the engine or vehicle type did not conform to the applicable requirements informed of the progress and results of the discussions with the manufacturer, the verification tests and the remedial measures. 1. On request of the approval authority and following in-service testing in accordance with Article 12 the manufacturer shall submit the plan of remedial measures to the approval authority no later than 60 working days after receipt of the notification from the approval authority. Where the manufacturer can demonstrate to the satisfaction of the approval authority that further time is required to investigate the reason for the non-compliance in order to submit a plan of remedial measures, an extension may be granted. 2. The remedial measures shall apply to all engines in service belonging to the same engine families or OBD engine families and be extended also to engine families or OBD engine families which are likely to be affected with the same defects. The need to amend the type-approval documents shall be assessed by the manufacturer and the result reported to the approval authority. 3. The approval authority shall consult the manufacturer in order to secure agreement on a plan of remedial measures and on executing the plan. If the approval authority which granted the original type-approval establishes that no agreement can be reached, the procedure set out in Article 30(1) and 30(5) of Directive 2007/46/EC shall be initiated. 4. The approval authority shall within 30 working days from the date on which it has received the plan of remedial measures from the manufacturer, approve or reject the plan of remedial measures. The approval authority shall within the same time also notify the manufacturer and all Member States of its decision to approve or reject the plan of remedial measures. 5. The manufacturer shall be responsible for the execution of the approved plan of remedial measures. 6. The manufacturer shall keep a record of every engine system or vehicle recalled and repaired or modified and of the workshop which performed the repair. The approval authority shall have access to that record on request during the execution and for a period of 5 years after the completion of the execution of the plan. 7. Any repair or modification referred to in paragraph 6 shall be recorded in a certificate supplied by the manufacturer to the owner of the engine or vehicle. 1. The manufacturer shall take all necessary measures, in accordance with this Regulation and Article 4 of Regulation (EC) No 595/2009, so as to ensure that the tailpipe emissions are effectively limited throughout the normal life of the vehicle and under all normal conditions of use. the requirement for the manufacturer to provide a statement of compliance with the requirements limiting off-cycle emissions. 2. The manufacturer shall fulfil the specific requirements, together with the associated test procedures, set out in Annex VI. 3. Any additional requirements with respect to off-cycle in-use vehicle testing referred to in point (d) of paragraph 1 shall be introduced after the assessment of the PEMS procedures set out in Annex II. The assessment shall be finalised by 31 December 2014. 1. The manufacturer shall ensure that replacement pollution control devices intended to be fitted to EC type-approved engine systems or vehicles covered by Regulation (EC) No 595/2009 are EC type-approved, as separate technical units in accordance with the requirements of this Article and of Articles 16 and 17. Catalytic converters, deNOx devices and particulate filters shall be considered to be pollution control devices for the purposes of this Regulation. 2. Original replacement pollution control devices, which fall within the type covered by point 3.2.12 of Appendix 4 to Annex I and are intended for fitment to a vehicle to which the relevant type-approval document refers, do not need to comply with all provisions of Annex XI provided that they fulfil the requirements of points 2.1, 2.2 and 2.3 of that Annex. the make and identifying part number of the original pollution control device as recorded in the information referred to in point 3.2.12.2 of Appendix 4 to Annex I. 5. Replacement pollution control devices shall only be type-approved according to Regulation (EC) No 595/2009 and this Regulation once the specific testing requirements are introduced in Annex XI to this Regulation. 2. The application shall be drawn up in accordance with the model of the information document set out in Appendix 1 to Annex XI. 3. The manufacturer shall submit a statement of compliance with the requirements on access to OBD and repair and maintenance information. an additional sample of the type of the replacement pollution control device, in the case of a replacement pollution control device intended to be fitted to a vehicle equipped with an OBD system. 5. For the purposes of point (a) of paragraph 4, the test engines shall be selected by the applicant with the agreement of the approval authority. The test conditions shall comply with the requirements set out in Section 6 of Annex 4B to UN/ECE Regulation No 49.
they shall be tuned properly and set to the manufacturer's specification prior to emission testing. 6. For the purposes of points (b) and (c) of paragraph 4, the sample shall be clearly and indelibly marked with the applicant's trade name or mark and its commercial designation. 7. For the purposes of point (c) of paragraph 4, the sample shall be a qualified deteriorated component. 1. If all the relevant requirements are met, the approval authority shall grant an EC type-approval for replacement pollution control devices as separate technical units and issue a type-approval number in accordance with the numbering system set out in Annex VII to Directive 2007/46/EC. The same type-approval number may cover the use of that replacement pollution control device type on a number of different vehicle or engine types. 2. For the purposes of paragraph 1, the approval authority shall issue an EC type-approval certificate established in accordance with the model set out in Appendix 2 to Annex XI. 3. If the manufacturer is able to demonstrate to the approval authority that the replacement pollution control device is of a type referred to in point 3.2.12.2 of Appendix 4 to Annex I, the granting of a type-approval shall not be dependent on verification of compliance with the requirements set out in Section 4 of Annex XI. Regulation (EC) No 595/2009 is amended in accordance with Annex XV to this Regulation. Directive 2007/46/EC is amended in accordance with Annex XVI to this Regulation. (3) OJ L 229, 31.8.2010, p. 1. (4) OJ L 275, 20.10.2005, p. 1. A universal fuel range approval shall be granted subject to the requirements specified in points 1.1.1 to 1.1.6.1. The parent engine shall meet the requirements of this Regulation on the appropriate reference fuels specified in Annex IX. Specific requirements shall apply to natural gas fuelled engines, as laid down in point 1.1.3. In the case of a natural gas fuelled engine the manufacturer shall demonstrate the parent engines capability to adapt to any fuel composition that may occur on the market within the European Union. In the case of natural gas there are generally two types of fuel, high calorific fuel (H-gas) and low calorific fuel (L-gas), but with a significant spread within both ranges; they differ significantly in their energy content expressed by the Wobbe Index and in their λ-shift factor (Sλ). Natural gases with a λ-shift factor between 0,89 and 1,08 (0,89 ≤ Sλ ≤ 1,08) are considered to belong to H-range, while natural gases with a λ-shift factor between 1,08 and 1,19 (1,08 ≤ Sλ ≤ 1,19) are considered to belong to L-range. The composition of the reference fuels reflects the extreme variations of Sλ. The parent engine shall meet the requirements of this Regulation on the reference fuels GR (fuel 1) and G25 (fuel 2), as specified in Annex IX, without any readjustment to the fuelling between the two tests. One adaptation run over one WHTC hot cycle without measurement is permitted after the change of the fuel. After the adaptation run the engine shall be cooled down in accordance with Section 7.6.1 of Annex 4B to UN/ECE Regulation No 49. At the manufacturer's request the engine may be tested on a third fuel (fuel 3) if the λ-shift factor (Sλ) lies between 0,89 (that is the lower range of GR) and 1,19 (that is the upper range of G25), for example when fuel 3 is a market fuel. The results of this test may be used as a basis for the evaluation of the conformity of the production. In the case of an engine fuelled with natural gas which is self adaptive for the range of H-gases on the one hand and the range of L-gases on the other hand, and which switches between the H-range and the L-range by means of a switch, the parent engine shall be tested on the relevant reference fuel as specified in Annex IX for each range, at each position of the switch. The fuels are GR (fuel 1) and G23 (fuel 3) for the H-range of gases and G25 (fuel 2) and G23 (fuel 3) for the L-range of gases. The parent engine shall meet the requirements of this Regulation at both positions of the switch without any readjustment to the fuelling between the two tests at each position of the switch. One adaptation run over one WHTC hot cycle without measurement is permitted after the change of the fuel. After the adaptation run the engine shall be cooled down in accordance with Section 7.6.1 of Annex 4B to UN/ECE Regulation No 49. At the manufacturer's request the engine may be tested on a third fuel instead of G23 (fuel 3) if the λ-shift factor (Sλ) lies between 0,89 (that is the lower range of GR) and 1,19 (that is the upper range of G25), for example when fuel 3 is a market fuel. The results of this test may be used as a basis for the evaluation of the conformity of the production. In the case of LPG there are variations in C3/C4 composition. These variations are reflected in the reference fuels. The parent engine shall meet the emission requirements on the reference fuels A and B as specified in Annex IX without any readjustment to the fuelling between the two tests. One adaptation run over one WHTC hot cycle without measurement is permitted after the change of the fuel. After the adaptation run the engine shall be cooled down in accordance with Section 7.6.1 of Annex 4B to UN/ECE Regulation No 49. Fuel range restricted approval shall be granted subject to the requirements specified in points 1.2.1 to 1.2.2.3. Exhaust emissions type-approval of an engine running on natural gas and laid out for operation on either the range of H-gases or on the range of L-gases. The parent engine shall be tested on the relevant reference fuel, as specified in Annex IX, for the relevant range. The fuels are GR (fuel 1) and G23 (fuel 3) for the H-range of gases and G25 (fuel 2) and G23 (fuel 3) for the L-range of gases. The parent engine shall meet the requirements of this Regulation without any readjustment to the fuelling between the two tests. One adaptation run over one WHTC hot cycle without measurement is permitted after the change of the fuel. After the adaptation run the engine shall be cooled down in accordance with Section 7.6.1 of Annex 4B to UN/ECE Regulation No 49. On delivery to the customer the engine shall bear a label as specified in Section 3.3 stating for which range of gases the engine is approved. Exhaust emissions type-approval of an engine running on natural gas or LPG and designed for operation on one specific fuel composition. The parent engine shall meet the emission requirements on the reference fuels GR and G25 in the case of natural gas, or the reference fuels A and B in the case of LPG, as specified in Annex IX. Fine tuning of the fuelling system is allowed between the tests. This fine tuning will consist of a recalibration of the fuelling database, without any alteration to either the basic control strategy or the basic structure of the database. If necessary the exchange of parts that are directly related to the amount of fuel flow such as injector nozzles is allowed. At the manufacturer's request the engine may be tested on the reference fuels GR and G23, or on the reference fuels G25 and G23, in which case the type-approval is only valid for the H-range or the L-range of gases respectively. On delivery to the customer the engine shall bear a label as specified in Section 3.3 stating for which fuel composition the engine has been calibrated. With the exception of the case mentioned in point 2.2, the type-approval of a parent engine shall be extended to all family members, without further testing, for any fuel composition within the range for which the parent engine has been approved (in the case of engines described in point 1.2.2) or the same range of fuels (in the case of engines described in either point 1.1 or 1.2) for which the parent engine has been type-approved. If the technical service determines that, with regard to the selected parent engine the submitted application does not fully represent the engine family defined in Part 1 of Appendix 4, an alternative and if necessary an additional reference test engine may be selected by the technical service and tested. HLt in the case of the engine being approved and calibrated for a specific gas composition in either the H-range or the L-range of gases and transformable to another specific gas in either the H-range or the L-range of gases by fine tuning of the engine fuelling. The EC type-approval mark shall also include in the vicinity of the rectangle the ‘base approval number’ contained in Section 4 of the type-approval number referred to in Annex VII to Directive 2007/46/EC, preceded by the two figures indicating the sequence number assigned to the latest technical amendment to Regulation (EC) No 595/2009 or this Regulation on the date EC type-approval for a separate technical unit was granted. 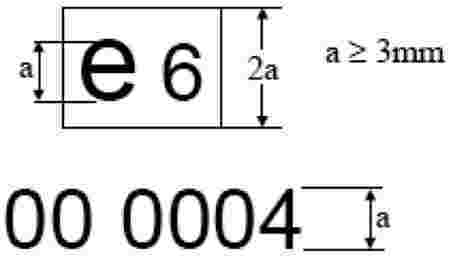 For this Regulation, the sequence number is 00. Appendix 8 gives examples of the EC type-approval mark. In the case of NG and LPG fuelled engines with a fuel range restricted type-approval, the following labels containing information provided in point 3.3.1 shall be affixed. In the case of point 1.2.1.3, the label shall state ‘ONLY FOR USE WITH NATURAL GAS RANGE H’. If applicable, ‘H’ is replaced by ‘L’. In the case of point 1.2.2.2, the label shall state ‘ONLY FOR USE WITH NATURAL GAS SPECIFICATION …’ or ‘ONLY FOR USE WITH LIQUEFIED PETROLEUM GAS SPECIFICATION …’, as applicable. All the information in the appropriate table in Annex IX shall be given with the individual constituents and limits specified by the engine manufacturer. The letters and figures shall be at least 4 mm in height. If lack of space prevents such labelling, a simplified code may be used. In this event, explanatory notes containing all the above information shall be easily accessible to any person filling the fuel tank or performing maintenance or repair on the engine and its accessories, as well as to the authorities concerned. The site and content of these explanatory notes shall be determined by agreement between the manufacturer and the approval authority. Labels shall be durable for the useful life of the engine. Labels shall be clearly legible and their letters and figures shall be indelible. Additionally, labels shall be attached in such a manner that their fixing is durable for the useful life of the engine, and the labels cannot be removed without destroying or defacing them. Labels shall be secured to an engine part necessary for normal engine operation and not normally requiring replacement during engine life. Additionally, these labels shall be located so as to be readily visible after the engine has been completed with all the auxiliaries necessary for engine operation. 3.4. In case of an application for EC type-approval of a vehicle with an approved engine with regard to emissions and access to vehicle repair and maintenance information or an EC type-approval of a vehicle with regard to emissions and access to vehicle repair and maintenance information, the label specified in Section 3.3 shall also be placed close to the fuel filling aperture. The characteristics of the exhaust after-treatment system shall be in accordance with those declared for the engine type-approval in Part 1 of Appendix 4.
as regard the compliance of the system ensuring the correct operation of NOx control measures, the installation shall, according to Appendix 4 of Annex XIII, meet the manufacturer's installation requirements as specified in Part 1 of Appendix 4. The inlet orifice of the petrol or E85 tank shall be designed so it prevents the tank from being filled from a fuel pump delivery nozzle that has an external diameter of 23,6 mm or greater. the vehicle is conspicuously, legibly and indelibly marked with the symbol for unleaded petrol specified in ISO 2575:2004 in a position immediately visible to a person filling the fuel tank. Additional marking are permitted. or in case of M1 or N1 vehicles, any other provision which has the same affect. Examples may include, but are not limited to, a tethered filler cap, a chained filler cap or one utilising the same locking key for the filler cap as for the vehicle’s ignition. In this case the key shall be removable from the filler cap only in the locked condition. This Section sets out the specifications and tests of the ECU data at type-approval for the purpose of in-service testing. For the purpose of in-service testing, the calculated load (engine torque as a percentage of maximum torque and the maximum torque available at the current engine speed), the engine speed, the engine coolant temperature, the instantaneous fuel consumption, and the reference maximum engine torque as a function of engine speed shall be made available by the OBD system in real time and at a frequency of at least 1 Hz, as mandatory data stream information. The output torque may be estimated by the ECU using built-in algorithms to calculate the produced internal torque and the friction torque. The engine torque in Nm resulting from the above data stream information shall permit a direct comparison with the values measured when determining the engine power according to Annex XIV. In particular, any eventual corrections as regards auxiliaries shall be included in the above data stream information. Access to the information required in point 5.2.1 shall be provided in accordance with the requirements set out in Annex X and with the standards referred to in Appendix 6 to Annex 9B to UN/ECE Regulation No 49. 10 % when performing the World Harmonised Steady state Cycle (hereinafter ‘WHSC’) test according to Annex III. The UN/ECE Regulation No 85 (2) allows the actual maximum load of the engine to differ from the reference maximum load by 5 % in order to address the manufacturing process variability. This tolerance is taken into account in the above values. External access to the information required in point 5.2.1 shall not influence the vehicle emissions or performance. The availability of the data stream information required in point 5.2.1 according to the requirements set out in point 5.2.2 shall be demonstrated by using an external OBD scan-tool as described in Annex X. In the case where this information cannot be retrieved in a proper manner, using a scan-tool that is working properly, the engine is considered as non-compliant. The conformity of the ECU torque signal to the requirements of points 5.2.2 and 5.2.3 shall be demonstrated when determining the engine power according to Annex XIV and when performing the WHSC test according to Annex III. In the case where the engine under test does not match the requirements set out in Annex XIV concerning auxiliaries, the measured torque shall be corrected in accordance to the correction method set out in Annex 4B to UN/ECE Regulation No 49. The conformity of the ECU torque signal is considered to be demonstrated if the torque signal remains within the tolerances set out in point 5.2.5. The engine family, as determined by the engine manufacturer, shall comply with Section 5.2 of Annex 4B to UN/ECE Regulation No 49. The parent engine of the family shall be selected in accordance with the requirements set out in point 5.2.4 of Annex 4B to UN/ECE Regulation No 49. The OBD engine family shall be determined by basic design parameters that shall be common to engine systems within the family in accordance with Section 6.1 of Annex 9B to UN/ECE Regulation No 49. Measures to ensure conformity of production shall be taken in accordance with Article 12 of Directive 2007/46/EC. Conformity of production shall be checked on the basis of the description in the type-approval certificates set out in Appendix 4 to this Annex. In applying Appendices 1, 2 or 3, the measured emission of the gaseous and particulate pollutants from engines subject to checking for conformity of production shall be adjusted by application of the appropriate deterioration factors (DF’s) for that engine as recorded in the Addendum to the EC type-approval certificate granted in accordance with this Regulation. The provisions of Annex X to Directive 2007/46/EC shall be applicable where the approval authorities are not satisfied with the auditing procedure of the manufacturer. All engines subject to tests shall be randomly taken from the series production. If emissions of pollutants are to be measured and an engine type-approval has had one or more extensions, the tests shall be carried out on the engines described in the information package relating to the relevant extension. After submission of the engine to the authorities, the manufacturer may not carry out any adjustment to the engines selected. Three engines shall be taken from the series production of the engines under consideration. Engines shall be subjected to testing on the WHTC, and on the WHSC if applicable, for the checking of the production conformity. The limit values shall be those set out in Annex I to Regulation (EC) No 595/2009. Where the approval authority is satisfied with the production standard deviation given by the manufacturer in accordance with Annex X to Directive 2007/46/EC, the tests shall be carried out according to Appendix 1 to this Annex. Where the approval authority is not satisfied with the production standard deviation given by the manufacturer in accordance with Annex X to Directive 2007/46/EC, the tests shall be carried out according to Appendix 2 to this Annex. At the manufacturer’s request, the tests may be carried out in accordance with Appendix 3 to this Annex. On the basis of tests of the engine by sampling as set out in point 7.2.2.2, the series production of the engines under consideration is regarded as conforming where a pass decision is reached for all the pollutants and as non-conforming where a fail decision is reached for one pollutant, in accordance with the test criteria applied in the appropriate Appendix. When a pass decision has been reached for one pollutant, this decision may not be changed as a consequence of a result from any additional tests made in order to reach a decision for the other pollutants. 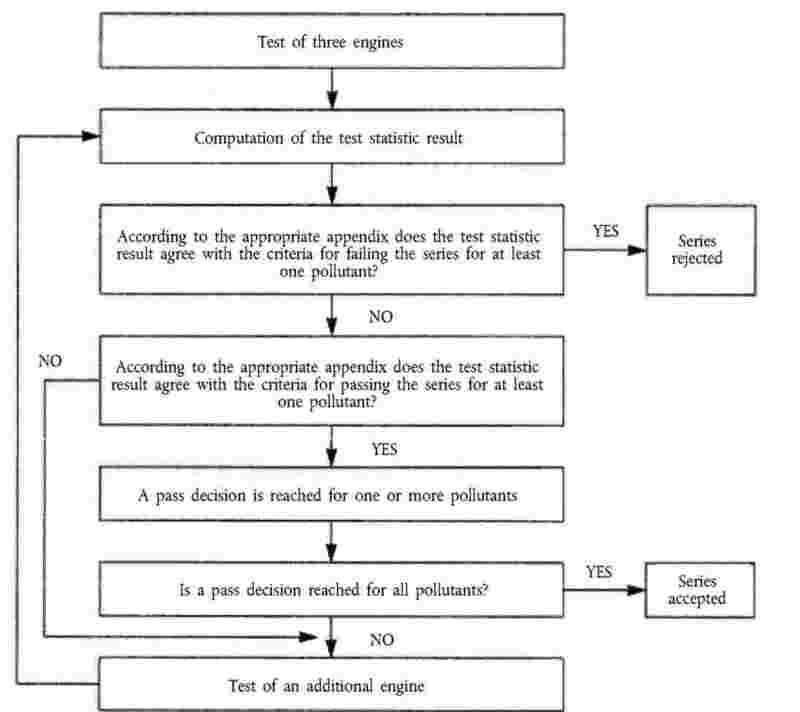 If a pass decision is not reached for all the pollutants and if no fail decision is reached for any pollutant, a test is carried out on another engine (see Figure 1). If no decision is reached, the manufacturer may at any time decide to stop testing. In that case a fail decision is recorded. The tests shall be carried out on newly manufactured engines. At the request of the manufacturer, the tests may be carried out on engines which have been run-in up to a maximum of 125 hours. In this case, the running-in procedure shall be conducted by the manufacturer who shall undertake not to make any adjustments to those engines. The evolution coefficient may have a value less than one. The subsequent test engines shall not be subjected to the running-in procedure, but their emissions when newly manufactured shall be modified by the evolution coefficient. for the other engines, the values when newly manufactured multiplied by the evolution coefficient. For diesel, ethanol (ED95), petrol, E85 and LPG fuelled engines, all these tests may be conducted with the applicable market fuels. However, at the manufacturer’s request, the reference fuels described in Annex IX may be used. This implies tests, as described in Section 1 of this Annex, with at least two of the reference fuels for each gas engine. However, at the manufacturer’s request, the reference fuels described in Annex IX may be used. This implies tests as described in Section 1 of this Annex. In the case of dispute caused by the non-compliance of gas fuelled engines when using a market fuel, the tests shall be performed with a reference fuel on which the parent engine has been tested, or with the possible additional fuel 3 as referred to in points 1.1.4.1 and 1.2.1.1 on which the parent engine may have been tested. Then, the result shall be converted by a calculation applying the relevant factors ‘r’, ‘ra’ or ‘rb’ as described in points 1.1.5, 1.1.6.1 and 1.2.1.2. If r, ra or rb is less than 1, no correction shall take place. The measured results and the calculated results shall demonstrate that the engine meets the limit values with all relevant fuels (fuels 1, 2 and, if applicable, fuel 3 in the case of natural gas engines and fuels A and B in the case of LPG engines). Tests for conformity of production of a gas fuelled engine laid out for operation on one specific fuel composition shall be performed on the fuel for which the engine has been calibrated. An engine shall be randomly taken from series production and subjected to the tests described in Annex 9B to UN/ECE Regulation No 49. The tests may be carried out on an engine that has been run-in up to a maximum of 125 hours. The production is deemed to conform if this engine meets the requirements of the tests described in Annex 9B to UN/ECE Regulation No 49. If the engine taken from the series production does not satisfy the requirements of point 7.3.1, a further random sample of four engines shall be taken from the series production and subjected to the tests described in Annex 9B to UN/ECE Regulation No 49. The tests may be carried out on engines that have been run-in up to a maximum of 125 hours. The production is deemed to conform if at least three engines out of the further random sample of four engines meet the requirements of the tests described in Annex 9B to UN/ECE Regulation No 49. The availability of the data stream information requested in point 5.2.1 according to the requirements of point 5.2.2 shall be demonstrated by using an external OBD scan-tool as described in Annex X. In the case where this information cannot be retrieved in a proper manner while the scan-tool is working properly according to Annex X, the engine shall be considered as non-compliant. The conformity of the ECU torque signal with the requirements of points 5.2.2 and 5.2.3 shall be demonstrated by performing the WHSC test according to Annex III. In the case where the test equipment does not match the requirements specified in Annex XIV concerning auxiliaries, the measured torque shall be corrected in accordance to the correction method set out in Annex 4B of UN/ECE Regulation No 49. The conformity of the ECU torque signal shall be considered sufficient if the calculated torque remains within the tolerances specified in point 5.2.5. The availability and conformity checks of the ECU information required for in-service testing shall be performed by the manufacturer on a regular basis on each produced engine type within each produced engine family. The results of the manufacturer’s survey shall be made available to the approval authority at its request. At the request of the approval authority, the manufacturer shall demonstrate the availability or the conformity of the ECU information in serial production by performing the appropriate testing referred to in points 7.4.1 to 7.4.4 on a sample of engines selected from the same engine type. The sampling rules including sampling size and statistical pass-fail criteria shall be those specified in this Annex for checking the conformity of emissions. The formal documentation package may be brief, provided that it exhibits evidence that all outputs permitted by a matrix obtained from the range of control of the individual unit inputs have been identified. The documentation shall describe the functional operation of the inducement system required by Annex XIII, including the parameters necessary for retrieving the information associated with that system. This material shall be retained by the approval authority. The extended documentation package shall include information on the operation of all AES and BES, including a description of the parameters that are modified by any AES and the boundary conditions under which the AES operate, and indication of which AES and BES are likely to be active under the conditions of the test procedures set out in Annex VI. The extended documentation package shall include a description of the fuel system control logic, timing strategies and switch points during all modes of operation. It shall also include a full description of the inducement system required in Annex XIII, including the associated monitoring strategies. The extended documentation package shall remain strictly confidential. It may be kept by the approval authority, or, at the discretion of the approval authority, may be retained by the manufacturer. In the case the manufacturer retains the documentation package, that package shall be identified and dated by the approval authority once reviewed and approved. It shall be made open for inspection by the approval authority at the time of approval or at any time during the validity of the approval. (2) OJ L 326, 24.11.2006, p. 55. In Section 3 of Appendix 1 to UN/ECE Regulation No 49 the reference to Section 5.2.1 of that Appendix shall be understood as reference to the table of Annex I to Regulation (EC) No 595/2009. In Section 3 of Appendix 1 to UN/ECE Regulation No 49, the reference to Figure 2 shall be understood as reference to Figure 1 of Annex I to this Regulation. In Section 3 of Appendix 2 to UN/ECE Regulation No 49, the reference to Section 5.2.1 of that Appendix shall be understood as reference to the table of Annex I to Regulation (EC) No 595/2009. In Section 3 of Appendix 3 to UN/ECE Regulation No 49 the reference to Section 5.2.1 of that Appendix shall be understood as reference to the table of Annex I to Regulation (EC) No 595/2009. In Section 3 of Appendix 3 to UN/ECE Regulation No 49, the reference to Figure 2 shall be understood as reference to Figure 1 of Annex I to this Regulation. In Section 5 of Appendix 3 to UN/ECE Regulation No 49, the reference to Section 8.3.1 shall be understood as reference to point 7.2.2 of this Annex. EC type-approval of a vehicle with regard to emissions and access to vehicle repair and maintenance information. If the systems, components or separate technical units referred to in this Appendix have electronic controls, information concerning their performance shall be supplied. Letters A, B, C, D, E corresponding to engine family members shall be replaced by the actual engine family members’ names. In case when for a certain engine characteristic same value/description applies for all engine family members the cells corresponding to A-E shall be merged. In case the family consists of more than five members new columns may be added. In the case of application for EC type-approval of an engine or engine family as a separate technical unit the general part and Part 1 shall be filled in. In the case of application for EC type-approval of a vehicle with regard to emissions and access to vehicle repair and maintenance information the general part and Parts 1 and 2 shall be filled in. Explanatory footnotes can be found in Appendix 10 to this Annex. PHOTOGRAPHS AND/OR DRAWINGS OF THE PARENT ENGINE, ENGINE TYPE AND, IF APPLICABLE, OF THE ENGINE COMPARTMENT. LIST FURTHER ATTACHMENTS IF ANY. Fuel consumption WHTC test (5) … g/kWh. For diesel engines at injection pump inlet, for gas fuelled engines at pressure regulator final stage. Note: requirements for engine-driven equipment differ between emissions test and power test. Explanatory foot notes can be found in Appendix 10 to this Annex. of a type of component/separate technical unit (1) with regard to Regulation (EC) No 595/2009 as implemented by Regulation (EU) No 582/2011. If CNG and LPG fuelled engines are tested on different reference fuels, the tables shall be reproduced for each reference fuel tested. of a type of a vehicle with an approved engine with regard to Regulation (EC) No 595/2009 as implemented by Regulation (EU) No 582/2011. of a type of a vehicle with regard to a system with regard to Regulation (EC) No 595/2009 as implemented by Regulation (EU) No 582/2011. The approval mark in this Appendix affixed to an engine approved as a separate technical unit shows that the type concerned has been approved in Belgium (e 6), pursuant to this Regulation. The first two digits of the approval number (00) indicate that this engine approved as a separate technical unit was approved according to this Regulation. The following four digits (0004) are those allocated by the type-approval authority to engine approved as a separate technical unit as the base approval number. (1) ‘NOx OTL’ monitoring requirements as set out in Table 1 and 2 of Annex X. (2) ‘PM OTL’ monitoring requirements as set out in Table 1 of Annex X. (3) ‘Performance monitoring’ requirements as set out in point 2.3.3.3 of Annex X. (4) Reagent quality and consumption ‘phase-in’ requirements as set out in points 7.1.1.1 and 8.4.1.1 of Annex XIII. (5) Reagent quality and consumption ‘general’ requirements as set out in points 7.1.1 and 8.4.1 of Annex XIII. To be documented in case of a single OBD engine family and if not already documented in the documentation package(s) referred to in line 3.2.12.2.7.0.4. Fuel consumption for the combined WHTC including cold and hot part according to Annex VIII. To be documented if not documented in the documentation referred to in point 3.2.12.2.7.1.1. Information concerning engine performance shall only be given for the parent engine. Specify the tolerance; to be within ± 3 % of the values declared by the manufacturer. If the means of identification of type contains characters not relevant to describe the vehicle, component or separate technical unit types covered by this information document, such characters shall be represented in the documentation by the symbol ‘?’ (e.g. ABC?123??). Classified according to definitions listed in Section A of Annex II to Directive 2007/46/EC. Determined in accordance with the requirements of Annex XIV. 1.1. This Annex sets out requirements for checking and demonstrating the conformity of in-service engines and vehicles. 2.1. The conformity of in-service vehicles or engines of an engine family shall be demonstrated by testing vehicles on the road operated over their normal driving patterns, conditions and payloads. The in-service conformity test shall be representative for vehicles operated on their real driving routes, with their normal load and with the usual professional driver of the vehicle. When the vehicle is operated by a driver other than the usual professional driver of the particular vehicle, this alternative driver shall be skilled and trained to operate vehicles of the category subject to be tested. 2.2. If the normal in-service conditions of a particular vehicle are considered to be incompatible with the proper execution of the tests, the manufacturer or the approval authority may request that alternative driving routes and payloads are used. 2.3. The manufacturer shall demonstrate to the approval authority that the chosen vehicle, driving patterns, conditions and payloads are representative for the engine family. The requirements as specified in points 4.1 and 4.5 shall be used to determine whether the driving patterns and payloads are acceptable for in-service conformity testing. 2.4. The manufacturer shall report the schedule and the sampling plan for conformity testing at the time of the initial type-approval of a new engine family. 2.5. Vehicles without a communication interface which permits the collection of the necessary ECU data as specified in points 5.2.1 and 5.2.2 of Annex I, with missing data or with a non-standard data protocol shall be considered as non-compliant. 2.6. Vehicles where the collection of ECU data influences the vehicle emissions or performance shall be considered as non-compliant. 3.1. After the granting of type-approval for an engine family the manufacturer shall perform in-service testing on this engine family within 18 months from first registration of a vehicle fitted with an engine from that family. In case of multistage type-approval first registration means first registration of a completed vehicle. The testing shall be repeated at least every 2 years for each engine family periodically on vehicles over their useful life period as specified in Article 4 of Regulation (EC) No 595/2009. At the request of the manufacturer the testing may stop 5 years after the end of production. 3.1.1. With a minimum sample size of three engines the sampling procedure shall be set so that the probability of a lot passing a test with 20 % of the vehicles or engines defective is 0,90 (producer’s risk = 10 %) while the probability of a lot being accepted with 60 % of the vehicles or engines defective is 0,10 (consumer’s risk = 10 %). 3.1.2. The test statistic quantifying the cumulative number of non-conforming tests at the n-th test shall be determined for the sample. otherwise, an additional engine is tested according to this Annex and the calculation procedure is applied to the sample increased by one more unit. In Table 1 the pass and fail decision numbers are calculated by means of the International Standard ISO 8422/1991. The approval authority shall approve the selected engines and vehicle configurations before the launch of the testing procedures. The selection shall be performed by presenting to the approval authority the criteria used for the selection of the particular vehicles. 3.2. The engines and vehicles selected shall be used and registered in the Union. The vehicle shall have been in service for at least 25 000 km. 3.3. Each vehicle tested shall have a maintenance record to show that the vehicle has been properly maintained and serviced in accordance with the manufacturer’s recommendations. 3.4. The OBD system shall be checked for proper functioning of the engine. Any malfunction indications and the readiness code in the OBD memory shall be recorded and any required repairs shall be carried out. Engines presenting a Class C malfunction shall not be forced to be repaired before testing. The Diagnostic Trouble Code (DTC) shall not be cleared. Engines having one of the counters required by provisions of Annex XIII not at ‘0’ may not be tested. This shall be reported to the approval authority. 3.5. The engine or vehicle shall exhibit no indications of abuse (such as overloading, misfuelling, or other misuse), or other factors (such as tampering) that could affect emission performance. OBD system fault code and engine running hours information stored in the computer shall be taken into account. 3.6. All emission control system components on the vehicle shall be in conformity with those stated in the applicable type-approval documents. 3.7. In agreement with the approval authority, the manufacturer may run in-service conformity testing comprising fewer engines or vehicles than the number given in point 3.1, if the number of engines manufactured within an engine family is less than 500 units per year. For the purpose of in-service conformity testing the payload may be reproduced and an artificial load may be used. In the absence of statistics to demonstrate that the payload is representative for the vehicle, the vehicle payload shall be 50 to 60 % of the maximum vehicle payload. The engine coolant temperature shall be in accordance with point 2.6.1 of Appendix 1. 4.4. The lubricating oil, fuel and reagent shall be within the specifications issued by the manufacturer. 4.4.2.1. If the manufacturer in accordance with Section 1 of Annex I to this Regulation has declared the capability to meet the requirements of this Regulation on market fuels declared in point 3.2.2.2.1 of Appendix 4 to Annex I to this Regulation, tests shall be conducted on at least one of the declared market fuels or blend between the declared market fuels and the market fuels included in Directive 98/70/EC and the relevant CEN standards. For exhaust after-treatment systems that use a reagent to reduce emissions, a sample of the reagent shall be taken. The reagent shall not be frozen. The trip shall consist of urban driving followed by rural and motorway driving according to the shares specified in points 4.5.1 to 4.5.4 In the case another testing order is justified for practical reasons and after the agreement of the approval authority another order of urban, rural and motorway operation may be used. Motorway operation is characterised by vehicle speeds above 75 km/h. 4.5.1. For M1 and N1 vehicles the trip shall consist of approximately 45 % urban, 25 % rural and 30 % motorway operation. 4.5.2. For M2 and M3 vehicles the trip shall consist of approximately 45 % urban, 25 % rural and 30 % motorway operation. M2 and M3 vehicles of Class I, II or Class A as defined in Annex I to Directive 2001/85/EC of the European Parliament and of the Council (1) shall be tested in approximately 70 % urban and 30 % rural operation. 4.5.3. For N2 vehicles the trip shall consist of approximately 45 % urban, 25 % rural and followed by 30 % motorway operation. 4.5.4. For N3 vehicles the trip shall consist of approximately 20 % urban, 25 % rural and followed by 55 % motorway operation. stop (vehicle speed = 0): 12,4 % of the time. 4.6.1. The trip shall be selected in such a way that the testing is uninterrupted and the data continuously sampled to reach the minimum test duration defined in point 4.6.5. 4.6.2. Emissions and other data sampling shall start prior to starting the engine. Any cold start emissions may be removed from the emissions evaluation, in accordance with point 2.6 of Appendix 1. 4.6.3. It shall not be permitted to combine data of different trips or to modify or remove data from a trip. 4.6.4. If the engine stalls, it may be restarted, but the sampling shall not be interrupted. 4.6.5. The minimum test duration shall be long enough to complete five times the work performed during the WHTC or produce five times the CO2 reference mass in kg/cycle from the WHTC as applicable. 4.6.6. The electrical power to the PEMS system shall be supplied by an external power supply unit, and not from a source that draws its energy either directly or indirectly from the engine under test. 4.6.7. The installation of the PEMS equipment shall not influence the vehicle emissions and/or performance. 4.6.8. It is recommended to operate the vehicles under normal daytime traffic conditions. 4.6.9. If the approval authority is not satisfied with the data consistency check results according to Sections 3.2 of Appendix 1 to this Annex, the approval authority may consider the test to be void. 4.6.10. The same route shall be used for the tests of vehicles within the sample described in points 3.1.1 to 3.1.3. 5.1. Verification of the availability and conformity of the ECU data stream information required for in-service testing. 5.1.1. The availability of the data stream information according to the requirements of point 5.2 of Annex I shall be demonstrated prior to the in-service test. 5.1.1.1. If that information cannot be retrieved by the PEMS system in a proper manner, the availability of the information shall be demonstrated by using an external OBD scan-tool as described in Annex X. 5.1.1.1.1. In the case where this information can be retrieved by the scan-tool in a proper manner, the PEMS system is considered as failing and the test is void. 5.1.1.1.2. In the case where that information cannot be retrieved in a proper manner from two vehicles with engines from the same engine family, while the scan-tool is working properly, the engine is considered as non-compliant. 5.1.2. The conformity of the torque signal calculated by the PEMS equipment from the ECU data stream information required in point 5.2.1 of Annex I shall be verified at full load. 5.1.2.1. The method used to check this conformity is described in Appendix 4. 5.1.2.2. The conformity of the ECU torque signal is considered to be sufficient if the calculated torque remains within the full load torque tolerance specified in point 5. 5.1.2.3. If the calculated torque does not remain within the full load torque tolerance specified in point 5.2.5 of Annex I, the engine is considered to have failed the test. 6.1. The test shall be conducted and the test results shall be calculated in accordance with the provisions of Appendix 1 to this Annex. 6.2. The conformity factors shall be calculated and presented for both the CO2 mass based method and the Work based method. The pass/fail decision shall be made on the basis of the results of the Work based method. 6.3. The 90 % cumulative percentile of the exhaust emission conformity factors from each engine system tested, determined in accordance with the measurement and calculation procedures specified in Appendix 1, shall not exceed any of the values set out in Table 2.
decide that the in-service conformity of an engine system family is unsatisfactory and proceed to the measures referred to in Article 13 and in Section 9 of this Annex. 8.1. Confirmatory testing is done for the purpose of confirmation of the in-service emission functionality of an engine family. 8.2. Approval authorities may conduct confirmatory testing. 8.3. The confirmatory test shall be performed as vehicle testing as specified in points 2.1 and 2.2. Representative vehicles shall be selected and used under normal conditions and be tested according to the procedures defined in this Annex. 8.4. A test result may be regarded as non-satisfactory when, from tests of two or more vehicles representing the same engine family, for any regulated pollutant component, the limit value as determined according to Section 6 is exceeded significantly. 9.1. The manufacturer shall submit a report to the approval authority of the Member State where the engines or vehicles subject to remedial action are registered or used when planning to conduct remedial action, and shall submit this report when deciding to take action. The report shall specify the details of the remedial action and describe the engine families to be included in the action. The manufacturer shall report regularly to the approval authority after the start of the remedial action. 9.2. The manufacturer shall provide a copy of all communications related to the plan of remedial measures, and shall maintain a record of the recall campaign, and supply regular status reports to the approval authority. 9.3. The manufacturer shall assign a unique identifying name or number to the plan of remedial measures. 9.4. The manufacturer shall present a plan of remedial measures which shall consist of the information specified in points 9.4.1 to 9.4.11. 9.4.1. A description of each engine system type included in the plan of remedial measures. 9.4.2. A description of the specific modifications, alterations, repairs, corrections, adjustments, or other changes to be made to bring the engines into conformity including a brief summary of the data and technical studies which support the manufacturer’s decision as to the particular measures to be taken to correct the non-conformity. 9.4.3. A description of the method by which the manufacturer informs the engine or vehicle owners about the remedial measures. 9.4.4. A description of the proper maintenance or use, if any, which the manufacturer stipulates as a condition of eligibility for repair under the plan of remedial measures, and an explanation of the manufacturer’s reasons for imposing any such condition. No maintenance or use conditions may be imposed unless it is demonstrably related to the non-conformity and the remedial measures.